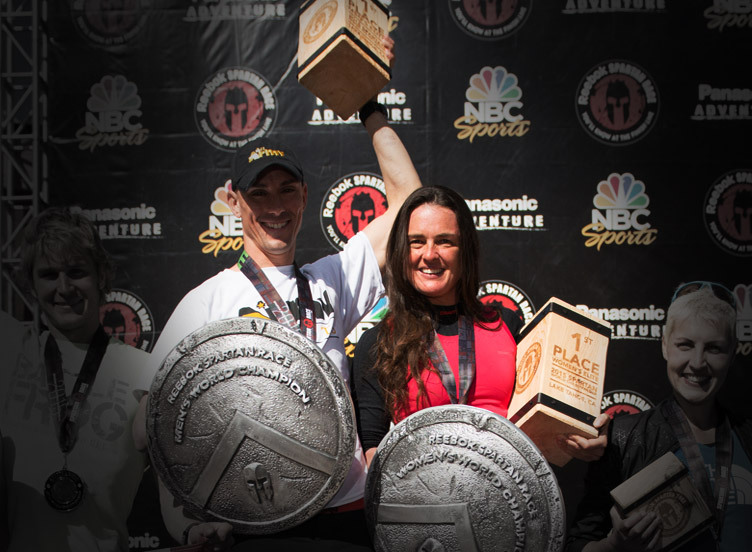 October 5th 2015 – In obstacle racing’s ultimate test of strength and endurance, Robert Killian and Zuzana Kocumova have been named 2015 Reebok Spartan Race World Champions. Finishing first amongst a field of thousands of athletes representing 15 countries, in front of a crowd of approximately 5,000 in Lake Tahoe, 33 year old US Military Captain Robert Killian from Longmont Colorado and 36 year old Zuzana Kocumova from Liberec, Czech Republic each earned over $15,000 in cash and prizes, along with the distinction of being named winner of the 2015 Reebok Spartan Race World Championship. Set on the same hallowed ground as the 1960 Winter Olympics, 10,000 athletes from across the globe scaled some of the most challenging mountain terrain to compete for over $100,000 in cash and prizes. This comes as part of the $500,000 in cash and prizes Spartan Race will award during the 2015 race season — the largest amount in race history. Additionally, NBC was once again on hand to film all of the action, and will televise the Reebok Spartan Race World Championship on December 26th, 2015 at 5p.m. ET– a culmination of the network’s comprehensive season-long coverage of Reebok Spartan Race which began in early July. Taking first in the men’s elite heat was Robert Killian with a time of 2:25:54. Finishing in second place was Ryan Atkins from Canada in 2:26:58, and Cody Moat finished third in 2:27:58. Emerging from the pack in the women’s elite heat to take first place was Zuzana Kocumova from Liberec, Czech Republic with a time of 2:53:01. Finishing in second place was Lindsay Webster from Canada in 2:58:02, and Rachel Paquette also from Canada finished third with a time of 2:58:39. The Reebok Spartan Race World Championship was situated at the crest of the striking Sierra Nevada mountain range in North Lake Tahoe, California, with the Reebok Spartan Race World Championship Beast (13+ miles/ 30+ obstacles) taking place on Saturday, in addition to a Spartan Sprint (3+ miles/ 20+ obstacles), a Spartan Beast, Ultra Beast (26+ miles/ 60+ obstacles), and Charity Challenge (3+ miles/ 20+ obstacles) on Sunday. The Spartan Kids race also took place on Saturday and Sunday. Spartan Race—voted Outside magazine’s Best Obstacle Race— is the world’s leading obstacle race company and the first of its kind to feature timing and global rankings. With more than 120 events in 20+ countries planned for 2015, Spartan Race has more than 1 million global participants, and offers open heats for all fitness levels as well as competitive elite heats. With 4-plus million engaged social media followers, brand extensions such as Spartan Training, which includes Spartan SGX certified programs and coaches, and a popular NBC television series, Spartan Race has made obstacle racing one of the fastest growing sports—and lifestyles— in the world. Spartan Race features races at three distances, 3+Mile/20+ Obstacle “Sprint,” 8+ Mile/25+ Obstacle “Super” and 13+ Mile/30+ Obstacle “Beast,” culminating each year in the Reebok Spartan Race World Championship. Visit https://www.spartan.com for more information, a schedule of events, and to register for a race. For more information about North Lake Tahoe, visit www.gotahoenorth.com. North Lake Tahoe is a 45-minute drive from the Reno Tahoe International Airport, two hours from Sacramento International Airport and just over three hours from San Francisco International Airport. Visitor information centers are located at 100 North Lake Boulevard in Tahoe City and 969 Tahoe Boulevard in Incline Village. Host of the 1960 Winter Olympics, Squaw Valley is a year-round mountain destination offering world-class adventures in every season. In summer, Squaw’s scenic aerial tram transports guests to elevation 8,200 feet to experience an array of exciting activities in a spectacular mountain setting including swimming, hiking, roller skating, disc golf and geocaching. At the base of the mountain, Squaw’s vibrant Village offers all new croquet, bean bag toss and a climbing wall, as well as shopping, al fresco dining, and music festivals all summer long.